Finally after a week off, finals footy was underway in Melbourne. Hawthorn came hard at Richmond from the start of the match but eventually the Tigers won the pressure battle. It was a wet Thursday evening leading into the match, but the game was sold out and 91,000 fans rolled into the MCG expecting to see a tough clash. The Tigers were firm favorites, but the Hawks finals experience could not be discounted completely. After the obligatory arm wrestle for the first five minutes, it was just a point to Hawthorn that came from a rushed behind. The first goal to come through Kamdyn McIntosh then again for the Tigers through Daniel Rioli three minutes later as they showed the Hawks why they were minor premiers. 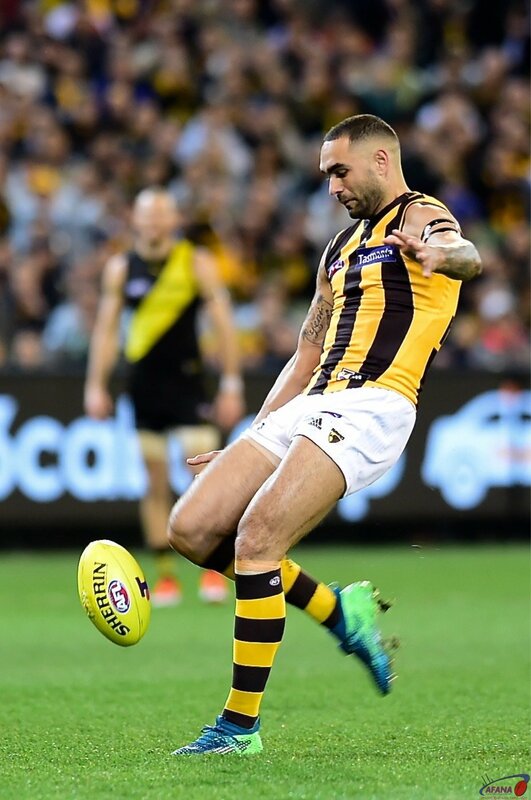 Shaun Burgoyne received a dubious free kick at the top of the goal square and should have kicked the Hawks first but somehow missed from just 15 meters out. It took a 50 meter penalty to Liam Shiels for the Hawks to register their first major in the 24th minute. The Hawthorn captain Jarryd Roughead was held without the ball at the top of the 50 and put the Hawks back in front from the set shot. Riewoldt turned Sicily inside out and marked deep in the pocket a minute from quarter time, but his shot just missed as both sets of fans held their breath. At quarter time it was a one point lead to the Hawks. While Richmond were able to shut down Hawthorns chipping game around the ground, the Hawks got numbers to every contest and used the man out the back to the contest regularly to escape the Tigers pressure. Mitchell, OMeara, Smith, and Shiels were good for the Hawks early. The second quarter saw more high pressure football. Under this regime both teams were missing goals they perhaps should have kicked. It was Richmond that pulled away as the quarter went on. Early in the quarter they perhaps sent the ball in to the 50 too high too often. This allowed the likes of Stratton and Sicily to spoil and clear. Rioli was forward of the contest in the forward pocket and was lucky when the ball squirted out to him, but his kick was all skill as he dribbled the ball through for the first goal of the quarter. Nine minutes of fierce battle ensued and then finally it was Conor Nash running back with the flight of the ball for Hawthorn and he marked Puopolo's kick inside 50. He went back and made no mistake from 15 meters out. Dustin Martin, came right into the game, getting center clearances and then was instrumental in the next two goals. Using pace, strength and skill up against the boundary line he snapped a long kick from deep in the pocket on the run, right through the middle of the goals. His follow up was a quick bounced handball forward of the pack on the half forward boundary to a teammate, and the kick to Rioli was almost pulled in as he went aerial, but spilled the ball to a waiting McIntosh who drilled the ball home. Breust would be ruing a missed opportunity missing a set shot during the quarter from 15m out straight in front. At halftime it was a 14 point lead to the Tigers. Martin and Cotchin racking up the possessions in that second quarter and threatening to break the game apart. If it looked like the Tigers were pulling away it was confirmed in the third quarter kicking five goals to the Hawks two. It was almost five minutes into the third quarter before the first goal and again it was the opportunist in McIntosh at the back of the pack cleaning up the spilled ball and rolling it home. A minute later it was Impey, who after a very quiet first half, snapped the ball on his left around the body for a much needed goal to the Hawks. Prestia was on the end of handball from a teammate at center half-forward, shrugged the tackle from Sicily, and kicked the goal from 52 meters out on the run. Rioli then kicked his second for the night, after forward pressure on Morrison spilled the ball to him on the run, and he ran into the open goal to score. Just as It looked like the Hawks might be down for the count, Roughead calmly kicked his second, pouncing on the ball and snapping around the corner. Thus giving a faint hope of a comeback to Hawks fans. Richmond continued to push hard inside their forward 50 and despite plenty of errors, finally broke through. When Jack Higgins had the ball spill in front of him and got the kick off for a goal they had finally without question broken the Hawks. A minute later it was Edwards again on the end of a ball belted forward, and kicked another taking the margin out to 37 points. The Hawks pushed late in the quarter but could only add behinds and the margin at the final break was 35 points. Some concern for Tigers fans as they came to the huddle with Alex Rance limping in. But when the fourth quarter began, it was business as usual as Rance lined up in the defending goal square. The last quarter was quite unremarkable, both teams knowing the damage was done. Until late in the quarter, every time Hawthorn added a goal, Richmond matched it. Tom Mitchell kicked his first for the night with a left foot snap out of the pack. But Richmond, this time from a brilliant Jack Higgins steal, kicked the goal through Caddy. A bright moment came late for the Hawks as Breust pounced on the ball and snapped truly. Again it was Caddy, at the other end on the end of another Higgins kick, who evened up for the Tigers. Isaac Smith roved a quick ball inside 50 and smashed home another late goal for the Hawks. This time it was Graham pulling it back for the Tigers. Jarryd Roughead kicked the last goal of the match for the Hawks to give them a win on the scoreboard for the final quarter. It was of little value as the Tigers ran out 31 point winners. Martin was brilliant for the Tigers, but he had plenty of support from Cotchin, Prestia, and Lambert around the ball and Caddy, Rioli, and McIntosh up forward. The Hawks required a perfect night to challenge the Tigers and too many times they turned the ball over or missed easy goals. For the Hawks there is a second chance next week to stay alive in the finals, while Richmond have another week off ahead of their preliminary final at the MCG.